The traveller on the road is nearly spirit-broken. A shepherd boy points to Apricot Flower Village in the far distance ahead. When talking about the Qingming Festival, literally “Pure Brightness Festival,” many Chinese people will promptly recall this famous verse by Tang poet Du Mu (803–852), titled “Qingming,” a poem that they can likely still recite having learned it as young pupils. Occurring on the 15th day after the spring equinox, and falling on April 5 this year, the festival takes place around the time of year when rainfall is common as the weather transitions to a warmer springtime. Also called “Tomb Sweeping Day,” the Qingming Festival is an occasion when Chinese families remember and honour those before them by visiting their ancestors’ gravesites to clean the grounds and pay homage with flowers, prayer, incense, and other respectful offerings. In this context, Du Mu’s poem describes the despondent state of a lonely traveller still on the road while others are already reunited with their families. The man is made all the more sad and gloomy by the nonstop rain. The poem takes a bright turn to convey a sense of hope when the shepherd boy points the traveller in the right direction toward an inn. It will be a place where he can find shelter and lodging as well as drown his sorrows in wine. Evoking a sense of sentimental loss and loneliness as well as a welcomed promise of warmth and brighter times ahead, the poem fittingly reflects the dual meaning of the Qingming Festival itself. Besides being a special family day for sweeping the ancestors’ tombs and clearing away weeds, it is also a time for people to celebrate the joy and renewal of spring and for farmers to diligently prepare for new growth in the fields. Other popular traditional activities include planting willows, wearing and decorating with willow branches, and playing games and sports such as tug-of-war, a type of football called “cuju,” and swinging on swings, said to improve health as well as cultivate courage. 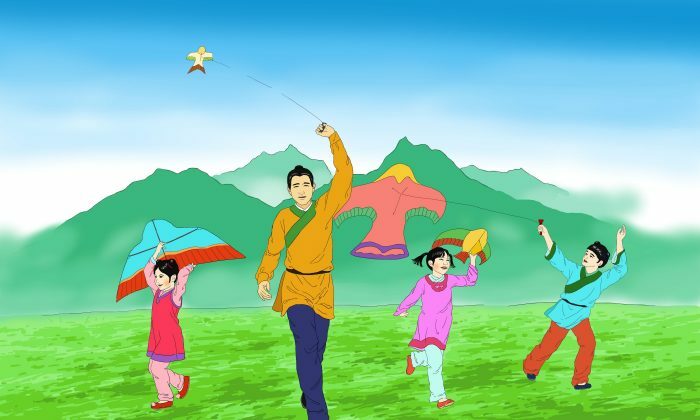 People also enjoy flying kites on this day. An old Qingming custom involves writing down all of one’s misfortunes on the kite, often shaped like a hawk, and then cutting the string while the kite is in the air, which symbolizes letting troubles and illnesses be gone with the wind. All living things grow at this time, and all are qing (clean) and ming (bright). Farmers in ancient times particularly hoped that these paper hawks flying high above the fields would help deter pests. As a method of determining the proper timing for planting and harvesting in their agrarian society, the ancient Chinese synchronized their calendar with the seasons by dividing the year into 24 periods, called solar terms, each typically consisting of 15 days. These included six solar terms for each of the four seasons. On the traditional Chinese calendar, the fifth solar term is called “Qingming,” and the Qingming Festival itself falls on the first day of this solar term of the same name. It is said that the ancients considered Qingming as consisting of three periods of five days each. During the first five days, the white flowers of the Chinese tung oil tree begin to bloom. During the next five days, the field mice disappear under stands of grass and into its burrow in the ground. Then during the last five days, one can see the colourful rainbow in the sky following the rain. The Qingming Festival literally translates as “pure and bright festival,” where 清 (qīng) carries the meanings of being pure, clean, clear, and innocent, while 明 (míng) refers to being bright and clear as well as intelligent and brilliant. 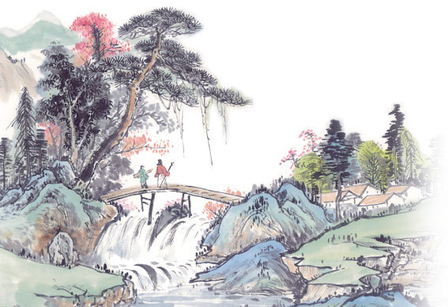 Among many classical Chinese poems depicting scenes of vitality during the Qingming Festival is a verse by Song Dynasty poet Ouyang Xiu (歐陽脩) (1007–1072), which describes a lush and idyllic landscape that offers a feast for the eyes. A flourishing display fills the eyes. Is there need for anyone to speak? Green willows, red wheels on decorated carriages passing by. Intoxicated persons sober up amid the clamour. All the way to the city gate, everywhere there are flowers. Part of a 10-poem series titled “Picking Mulberries,” the words laud the goodness and beauty of West Lake in Hangzhou, a peaceful place of retreat and classic scenery that has inspired many of China’s poets and painters since the Tang Dynasty (618–907).